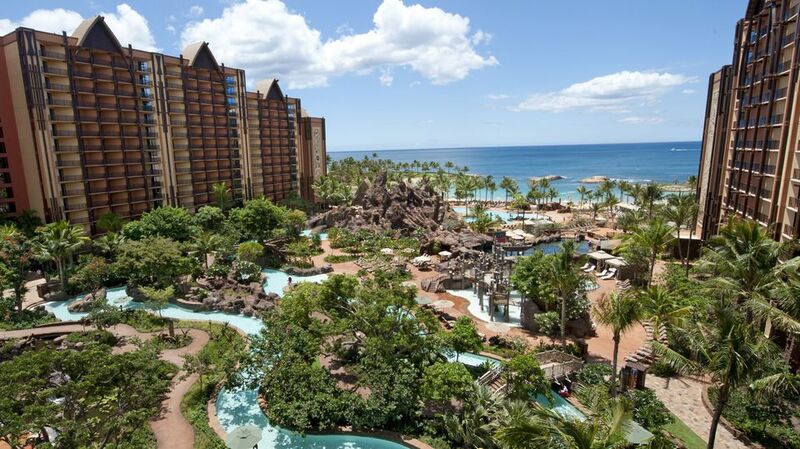 Why should you consider booking a vacation to Aulani, Disney's resort on the island of Oahu in Hawaii? Perhaps the most obvious reason is that it is located at one of the most beautiful destinations on the planet. But there are plenty of hotels and resorts on the island of Oahu at a wide variety of price points. You could save a load of dough by finding a hotel with a lower rate, and you'd still be able to enjoy a vacation in a veritable paradise. So why should you pay the big bucks — and a stay at Aulani will make a noticeable dent in your travel budget — to experience Disney's version of paradise? Is it worth it? How does it differ from resorts that charge comparable rates? Let's run down some of the best and most unique things about the hotel so that you can get a sense about its relative value and help determine whether you should splurge on your next vacation. One of the most compelling reasons to visit Aulani is Disney's legendary attention to detail. And by details, we don't mean small things such as engraving the hotel's logo onto the soap bars or creature comforts such as luxurious overhead rain showers (both of which the resort provides). We're referring to the incredible care and attention that the Mouse injects into all of its endeavors to take them to the next level. It's the details and the Imagineers' devotion to and gift for storytelling that help make the famous "Disney magic." Garden variety amusement parks have roller coasters. Disney's Animal Kingdom at Disney World, however, has Expedition Everest, a highly themed ride through the Himalayan Mountains for an encounter with the mythical Yeti that comes complete with a reconstructed Nepalese village. Similarly, nearly everything at Aulani is imbued with an extra layer of meaning, and it all weaves together to form a cohesive whole. Instead of the fanciful, mythical lands that Disney conjures at its parks, the stories it has created at its Oahu resort are all about the people, places, and culture of Hawaii. For example, the resort doesn't just have water slides. They are slides built into "volcanoes" that are located in the "Waikolohe Valley," a water play area with its own fanciful back story. Instead of a children's activity center, there is Aunty's Beach House, which is presided over by a doting woman who gently teaches her charges about her native island while providing care. The Aunty character is reinforced throughout the resort to maintain continuity and keep the story flowing. What's the Hawaiian Word for Detail? Or take The 'Olelo Room. At any other hotel, it would be a cocktail lounge. Sure, you could get a Mojito there. But you could also learn some Hawaiian words and phrases to go with your drink, because all of the bartenders are fluent in the language. There are whimsical carvings and wall hangings throughout the lounge that depict items and their accompanying Hawaiian word. It's a clever and engaging way to start a dialogue about the language and promote the culture. The capper on this piece of wonderful Imagineering edutainment? 'Olelo is the Hawaiian word for "word." Does everyone take the time to notice and appreciate all of the backstories and vast amount of detail embedded throughout Aulani? Perhaps not. But everybody takes it in on at least a subconscious level and would be acutely aware if the details were missing. Would this matter to you? Only you could answer that. But the details are largely what make Aulani a Disney resort and are a significant part of what you'd be springing for if you booked a visit. Disney's iconic characters, including Goofy, Chip, Dale, Minnie Mouse, Donald Duck, and the big cheese himself, Mickey Mouse, are all present and accounted for at Aulani. Stitch, Disney's Hawaiian (and interplanetary) toon ambassador, as well as Moana, also join the gang for meet-and-greets and other interactions. As with the Disney Cruise Line, getting quality face time with Mickey and his pals is considerably easier at Aulani as compared to the character chaos at the theme parks. Especially during slower seasons, guests should be able to nab plenty of photos and autographs with the popular posse. The characters are stationed at posted times near the front of the "Waikolohe Valley" in the center of the resort. Photographers are there to capture the meet-ups (and, of course, to sell the photos to guests). The Makahiki Buffet offers character breakfasts and dinners, which includes table-to-table personal greetings from the Disney buddies as well as group activities that involve the characters and a singer/storyteller. Dressed in their finest Hawaiian duds, Mickey and his buds also participate in the KA WA‘A luau and pop up in other places throughout the resort. Located on the western shore, or the leeward side, of Oahu, the sun puts on a free show each evening over the bay at Aulani. Casting yellow, then orange, then crimson hues in the sky and on the water, the sunsets are breathtaking and never get old. They can be enjoyed on the beach and at the far end of the pool area. For a special treat, consider booking a reservation to coincide with the sunset at 'Ama'Ama, the resort's signature, fine dining eatery. Overlooking the bay and open to the outside, the view is always great at the restaurant, but at sunset it is spectacular. Extending from the hotel down to the ocean bay, the resort's "Waikohole Valley" is where the water park attractions and pools are located. (Waikohole means "mischievous water" in Hawaiian.) It is lushly landscaped at the near end, but like the island topography it represents, albeit on a much smaller scale, the flora gets sparser as it approaches the ocean. The valley is punctuated at the far end by a dramatic volcano. A lazy river, which Disney dubs the Waikohole Stream, flows through the valley. While it is not as long as the massive river at Disney World's Typhoon Lagoon, it is much longer than the poor excuses for lazy rivers that other resort hotels sometimes offer. Likewise, the two water slides, which are cleverly embedded in the volcanic mountain, may not equal the hyper-thrill extremes that Summit Plummet delivers at Disney World's Blizzard Beach, but they are surprisingly long, surprisingly potent, and are considerably more satisfying than the wimpy slides some resorts offer (if they have water slides at all). The resort also offers the Menehune Bridge, an interactive water play area with geysers, water cannons, a huge dump bucket, and other gotchas. Other ways to get wet at Aulani include a large activity pool, whirlpool spas, an adults-only pool, a water play area for toddlers, and two lovely infinity pools that overlook the ocean. There are a number of eateries throughout the resort, and, for the most part, they offer delicious food that focuses on locally sourced Hawaiian ingredients and features regional island cuisine. For example, with its perfect climate, much of Hawaii's fruit is always in season, and it is glorious. Whether it is the abundant, all-you-can-eat fruit at the Makahiki buffet, the Açai Bowl with berries and banana that is served for breakfast at the signature 'Ama'Ama restaurant, or the fresh pineapple and papaya available at the quick-service Ulu Cafe, you just can't go wrong with any of the fruit offered at Aulani. Of course, digestive systems cannot live on fruit alone. The artfully prepared dishes 'Ama'Ama serves at dinner are exquisite, if pricey. If money is of little concern (lucky you), then by all means consider making multiple visits to sample its menu. For breakfast, you could head to Makahiki for its character meal. The food is great (be sure to try the Loco Moco, a Hawaiian multi-culti, calorie- and cholesterol-buster that includes a hamburger, rice, gooey fried egg, and gravy), and kids would love the characters. The show, which features perky songs and an occasional pot-clanging dance through the dining room can be a bit much for childless, morning-challenged couples to endure for more than one day, however. It is also fairly expensive. You might think that the informal Ulu Cafe, which was added to the resort as part of a 2013 expansion, might be a cost-effective alternative. But the a la carte prices can be surprisingly high here. A morning meal at 'Ama'Ama might actually be cheaper, and certainly offer better value. Served on real dinnerware amid the restaurant's lovely ambiance, intriguing options include an omelet served with Kalua pig, spinach and tomatoes. Other places to catch some lighter fare include heavy appetizers at the 'Olelo Room lounge and sandwiches and finger food at the Off the Hook lounge. There are many luaus available to experience throughout Hawaii. But the KA WA‘A luau, which Aulani launched in November 2016, is especially wonderful. The food, served buffet style, is both authentic and delicious. Choices include poke, a whole suckling pig served with steamed bao buns, and banana bread pudding made with locally grown bananas. The show, in typical Disney fashion, weaves a compelling story that two hosts tell about their ancestors’ journeys to Hawaii. Other performers include hula dancers and fire twirlers. Aulani guests share the beach with folks staying at the the adjacent Marriott hotel. Actually, like all of the beaches throughout Hawaii, it is free and open to the public. Guests need to use their room cards to gain access to Aulani's pool area, but anybody can enjoy the beach. You'll be wowed by the lovely outdoor hydrotherapy garden with its collection of rain showers (each featuring a different spray arrangement) and its soaking tubs, among other highlights). An indoor waterfall, a wishing pond, and other touches contribute to the unique and inspired ambiance. Conforming to the Disney formula, even the spa joins in the storytelling, says Lucia Rodriguez Amasio, Laniwai's director. "In addition to providing massages and treatments, the therapists explain the spa's connection to Hawaiian culture," she says. "The water elements celebrate the gift of rain, for example, which is vital to the islands and a gift of life." The therapists also encourage guests to make a wish and cast a stone on its behalf (hence the wishing pond). The distinctive look and feel and the storytelling aspect shouldn't be all that surprising, since Laniwai is the first Disney spa to be designed by Imagineers. (The spas at Disneyland, Disney World, and the cruse ships were all the product of third-party designers.) In addition to treatments for adults and couples, the spa caters to the resort's family audience with a space designated exclusively for teens, "Minnie Me" experiences for children under 12 (which are similar to the Bibbidi Bobbidi Boutiques at the parks and cruise ships), and family treatments that accommodate parents and their kids at the same time. There is even a treatment for parents and babies that demonstrates massage techniques mom and dad can try when they return home. Yes, the rates can be comparatively high at Aulani, but the activities and amenities that are included at no additional charge, many of which are things that are distinctly Disney, are extensive. And many of them are quite compelling. The full-featured resort is sort of like an activity-stuffed cruise ship on land. Consider whether you and your gang would make use of the extras, and then consider their total value as you compare and contrast hotels and plan your Hawaiian vacation. We've already mentioned some of the features, including the water park attractions, the pools, and the meet-ups with Mickey and his buddies. But there are a host of other things to do, many of which are geared to children. Aunty's Beach House, which is available for kids ages 3 to 12, offers childcare along with a host of supervised activities such as crafts making, hula instruction, and scavenger hunts. Mickey and his friends occasionally bop in to the clubhouse to interact with the children. A few optional experiences do cost extra, but nearly all of Aunty's Beach House activities are complimentary. In addition to the supervised clubhouse, the resort offers a number of other things to do that children could enjoy with their families such as nightly storytelling around a fire pit, pool parties with trivia contests and other activities, sand sculpturing, musical entertainment, and outdoor Disney movies. Teens have their own dedicated area at the resort, Painted Sky, that offers computer stations, a lounge, and organized activities. There are adult-geared activities at the resort as well, such as yoga, guided tours of the Hawaiian artifacts at Aulani, and a no-kids-allowed pool tucked into a quiet area. Guests of all ages could enjoy the resort's community room, which offers both supervised and DIY activities. There are video games, board games, books, and DVDs available as well as crafts making, ukelele playing, and other opportunities presided over by Disney staffers. Perhaps the most intriguing only-at-a-Disney-resort thing to do is the Menehune Adventure Trail. Using nifty interactive devices (essentially souped-up smartphones), families are led on a hunt around the resort for the mythical Hawaiian imps. By correctly deciphering clues, things embedded in the environment mysteriously spring to life. Like the employees at Disney's theme parks, the staff members ("cast members" in Disney-speak) at Aulani, are relentlessly cheerful and helpful. They also incorporate an overlay of Hawaiian hospitality and help make a stay at the resort that much more enjoyable and memorable. "The people of Hawaii are known for their 'Aloha spirit,' " says Elliot Mills, Aulani's vice president and general manager and an Oahu native. "There is a welcomeness and an openness that is part of the culture. We want our guests to have that feeling." Employees will initiate conversations, particularly with guests who appear to be in need of directions or assistance, but they strike an agreeable balance between being accommodating and overbearing. Excursions, many of which include transportation and guides, can be booked through Aulani. Options include helicopter tours, dolphin-watching cruises, and Pearl Harbor visits. According to Elliot Mills, the most popular excursion is surf school which offers surfboard lessons for beginners. Another popular choice is a guided walking tour of Waimea Valley on the island's North Shore. It includes visits to a botanical garden and a waterfall. You see the signs everywhere throughout Hawaii advertising shave ice, a local treat that is beloved by islanders as well as visitors. It's certainly not unique to Aulani, but the fact that the resort has its own shave ice stand makes it utterly convenient for guests to indulge in the colorful, cool confection. For the uninitiated, the treat begins as a block of ice which is placed into a machine with whirling blades that shave it into a fine snow. Preparers shape the snow into a ball, place it into a wide plastic cone, and slather it with the customer's choice of sweet syrups ranging from orange and strawberry to more exotic Hawaiian flavors such as lilikoi (passion fruit) and li hing mui (sour plum). Most stands offer toppings such as azuki beans and mochi balls, but the Aulani one only offers sweetened condensed milk (known as a "snow cap") and vanilla ice cream. By the way, on the mainland, amusement parks and other vendors offer something called a snow cone. It's somewhat similar to Hawaii's signature treat, except its consistency is chunkier, and it should more accurately be called crushed ice. Shave ice, with its fluffy consistency (all the better to soak up the intoxicating flavors) should probably be called snow. Go figure. Disney has gone to great lengths to tell the story of Hawaii at Aulani. Some of the experiences are overt, such as the luau show which showcases hula dance along with traditional and contemporary native music. There are many more subtle touches embedded throughout the resort, however, waiting to be discovered. "The stories are rich," says Imagineer Joe Rohde, the resort's chief designer. "You can touch them at any level from quite superficial to a real deep and transformative experience." The lobby for example, is filled with artifacts, including a wraparound mural and tiki totems. They are one-of-a-kind items that portray Hawaiian culture as expressed by its people. Guests could, and do, walk past without taking full note of them, although they are presented in such a dramatic fashion, they are hard to miss. Then again, unlike a museum, none of the items are accompanied by any kind of information to indicate their significance. That is by design. "It is a passive look at Hawaiian culture," says Elliot Mills, the resort's general manager. "We want guests to interact with staff, to ask them questions about what they see. We want to engage them in a conversation." For a more formal and comprehensive overview of the artifacts, Aulani offers complimentary guided tours of the lobby and grounds. On the tour, you could learn that there is a male and female side of the resort's main building. On the masculine side of the lobby for example, the tiki statue, which is a sacred Hawaiian object, is the God of war, while the God of new life graces the feminine side. It takes a fair amount of effort and forethought for the resort's guests to make the trek to Hawaii, Rohde notes. Once people arrive, he wants to make sure that they know and appreciate the place, its people, and its culture. "It is our obligation to create stories with great depth," he says. Has this ever happened to you? It is the last day of your vacation, your return flight leaves in the evening, and the checkout time at your lovely oceanfront resort is 11 a.m. Do you spend the rest of your day listening to TSA announcements and hanging out under the fluorescent lights at the airport? Ugh. How much better would it be to spend the rest of your day listening to the surf crash and hanging out under an umbrella at the beach? At Aulani you can. The resort offers the Luana Lounge, a complimentary place that includes showers, lockers, comfortable seating areas with large-screen TVs, a monitor listing departures at Honolulu Airport, and a computer and printer to print boarding passes. Guests could stow their luggage with the hotel's bell services and pack day bags, some of which they could place in the lounge's lockers, to fully enjoy their final day at the resort. The lounge opens at 7 a.m. to accommodate early arrivals as well. It would be nice if the changing rooms included a few more niceties, such as hair dryers and toiletries that might be found at a well-stocked health club. The bathing suit water extractor is a welcome bonus, however.